Jane Blonde is back from her last mission and gets sucked into her second adventure when she learns that some scientists believe that they have found the secret to a cat’s nine lives- and need Trouble, her spy cat to confirm their beliefs. This mission takes Janey places where she never thought of being when she started her spy life. With the help of her godmother G-mamma, her friend and fellow spylet Alfie Halliday and his mum Mrs Halliday and her Uncle Sol, Jane Blonde is ready for anything that comes her way. Jill Marshall moved from the UK to New Zealand with her daughter and dog. In 2001 Jill stopped working at a big international company to concentrate on her childhood ambition and write books for children. When Jill isn’t juggling a busy life that includes working, writing and being a mother she lets out her musical talent by playing guitar, having singing lessons and learning to play her drum kit which she assembled herself in her garage. This book by Jill Marshall is another great story to add to the bookshelf! Perfect for you if you like some action and a few laughs. 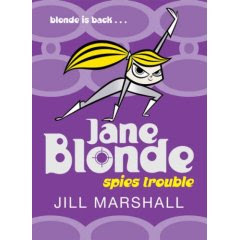 The other books in the Jane Blonde series are Jane Blonde Sensational Spylet, Jane Blonde Twice the Spylet and Jane Blonde Spylet on Ice. What I like about the Jane Blonde series is that it’s really just about a normal school girl living a hectic double life and that should appeal to many young girls everywhere.